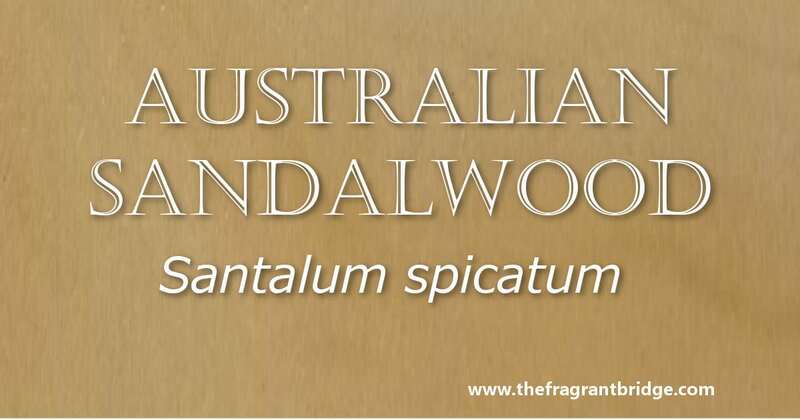 Although I have Indian and African sandalwood I prefer to use Australian sandalwood. Aroma: Similar to Indian sandalwood but softer. Plant: Small evergreen tree/shrub growing up to 8 metres in the wild and 4-5 metres on plantations. It is a root parasite and requires a host tree for its first years. At 3 years it requires 2 or 3 hosts as it grows. It appears the host trees are not harmed and in fact benefit from this arrangement. Main Growing Areas: South Western Australia, southern South Australia. Major Constituents: alpha santalol, beta santalol, farnesol, bergamatol, alpha-bisabolol. Interesting snippets: Although the tree will produce essential oil at 5-10 years it will not be suitable for harvesting a high quality oil until it is 25 years old. 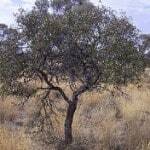 The west Australian aborigines used boiled sandalwood bark as a cough medicine. They also used the inside of the nuts as a rubbing medicine for colds and stiffness. Before the release of penicillin in 1946 oral ingestible Australian sandalwood capsules were used to treat urinary tract infections and gonorrhoea. Part of Plant used / Extraction: Heartwood and rootball by organic solvent extraction followed by co-distillation. This process yields about 3% essential oil. There is also a CO2 extraction available. Therapeutic actions: Dry coughs, nasal and chest congestion. Dry dehydrated skin, red inflamed skin, psoriasis, eczema and MRSA. Emotional and Spiritual: Stress, aphrodisiac. Quietens mental chatter, helping to still the mind, allowing it to move into a deep meditative state. Audre Gutierrez writes that Australian sandalwood is for all of those who have been made to feel ‘less than’ or ‘not good enough’ because of who they are. She is about being your true, authentic, best self and letting that speak more loudly than any disparagement, any slight ever could. She is for the unseen wounds of the heart and spirit, healing them so that you can be strongly and fully in the power of who you truly are. This entry was posted in Essential Oils and tagged anti-inflammatory, anxiety, colds, meditation. Australian sandalwood essential oil, sinusitis, skin care, stress on January 21, 2016 by Carole Hodges. Colour: Clear, colourless to pale yellow. Dark yellow indicates old or oxidized oil. 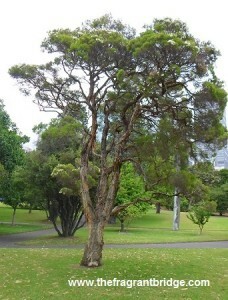 Plant: An evergreen tree that grows to 7 metres with paper like bark, small narrow leaves and profuse flowers. Main Growing Areas: East coast of Australia. Major Constituents: terpinene-4-ol, gamma-terpinene, alpha-terpineol, 1.8 cineole, para-cymene. 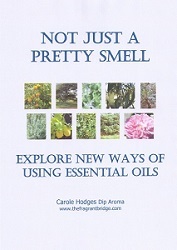 Interesting snippets: The first essential oil distillation was done in 1924. The botanical name comes from the Greek melos meaning dark or black, and leukon meaning white. This was a reference to the white papery bark on the higher trunk and the black bark on the lower trunk. 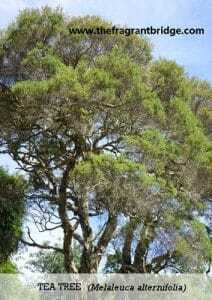 From the 1790s onwards, the first European settlers who colonised the areas around the Clarence and Richmond Rivers learned from the Bundjalong tribe how to use the leaves for healing purposes, such as inhalations for respiratory ailments, and poultices, infusions and ointments for infected wounds. Part of Plant used / Extraction: Leaves and twigs by steam distillation. Yield varies from 1.8 to 3.5%. The oil oxidises over time. Therapeutic actions: Infected skin rashes, acne, boils, colds, flu, tinea, candida, sore throat. Emotional and Spiritual: Nervous debility, mental fatigue and chronic lethargy. Robbi Zeck writes that tea tree will take you beyond any points of difference, raise your tolerance level and encourage you to see the bigger picture. It builds confidence and a strong sense of integrity that also helps to develop robust immunity and inner containment. 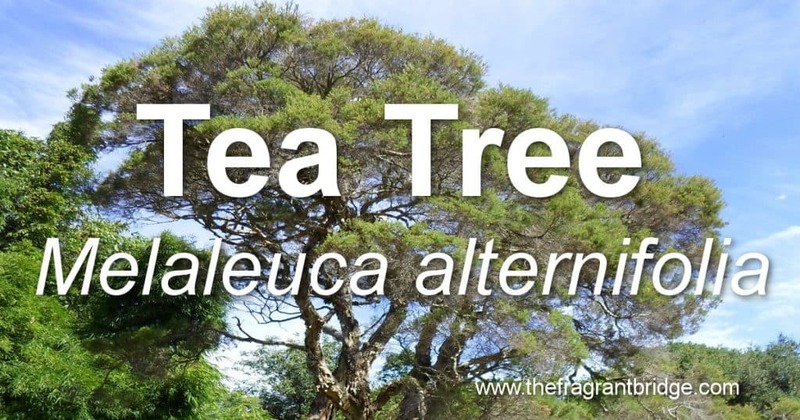 Gabriel Mojay writes that tea tree oil is of special importance to physically delicate individuals who struggle not only with their bodies, but with the feelings of victimisation and doom that can easily accompany and exacerbate chronic ill-health. Replace your “victim” mentality and feelings of doom and gloom with a feeling of understanding. Take a step back; release the struggle in life by understanding why events happen. By finding patience and seeing other points of view, you bring tolerance and growth into your environment and life. Enjoy the chance to learn to understand yourself and the others in your life. 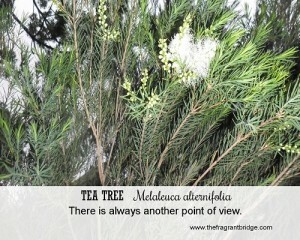 Fragrant Change Healing card: There is always another point of view. Are you dealing with a challenging situation, problem or person? Are you trying to find an answer but it keeps eluding you? Do you lack confidence and think of yourself as a victim in this situation? Are you feeling confused and emotionally shattered? Try looking at it from a new perspective. Take a wider view and look at the bigger picture rather focussing on a small part of it. Change your attitude from one of victim to one of a confident, focussed individual who has the ability to remain strong no matter what kind of toxic or challenging circumstances they find themselves in. Remember you have the strength and insight to deal with this challenge or person. This entry was posted in Essential Oils and tagged colds and flu, infected skin, mental fatigue, tea tree on January 13, 2016 by Carole Hodges. Aroma: Warm and sweet aniseed-like aroma. Plant: Perennial herb that grows up to 2 metres high with feathery leaves and golden yellow flowers. Main Growing Areas: The Mediterranean, Southern California, India and Japan. Major Constituents: Anethole, limonene, fenchone, methyl chavicol, myrcene, anisic aldehyde, 1.8-cineole. 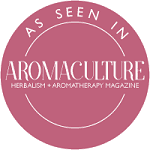 Possibility of the essential oil being adulterated with synthetic anethole. 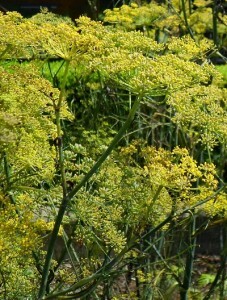 Ancient Chinese used fennel as a cure for snakebite. The seeds were carried by Roman soldiers on long marches to chew when they didn’t have time to stop and have a meal. Ancient Greek athletes who took part in the Olympic Games ate fennel seeds to give them energy without putting on extra weight. 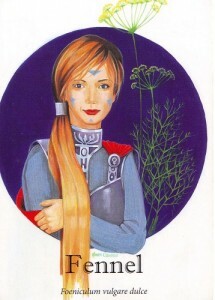 Pliny recommended fennel for both physical and second sight. 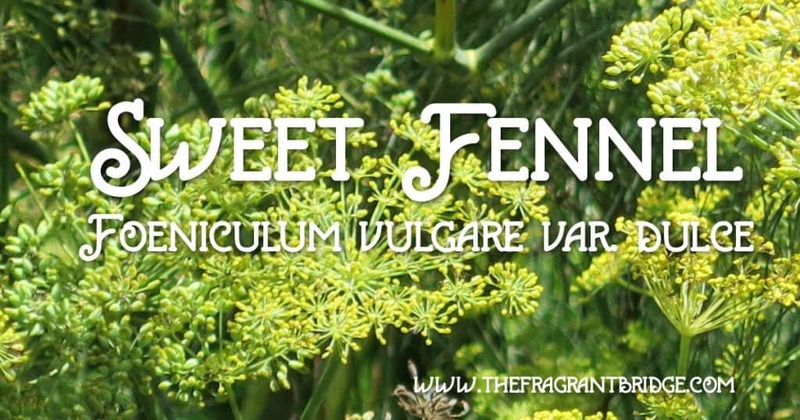 Fennel was introduced to America in the 18th century by Spanish priests and continues to grow wild on the sites of old missions. Gripe water used to calm colic in children is made by mixing fennel water with sodium bicarbonate and syrup. Part of Plant used /Extraction: Steam distillation of the dried crushed seeds (called fruit by some). 225 kgs of fennel seeds yields approximately 450 mls of essential oil. Therapeutic actions: Antispasmodic, stomach tonic, flatulence (wind), abdominal cramps, nausea, hiccups, PMS, regulates scanty painful periods. Emotional and Spiritual: Calms body and mind, stress, nervousness. Strength and courage in adversity. Robbi Zeck writes that fennel assists in completing things that are unfinished or requiring further attention in your life. When things are fully completed you reach the end of a cycle knowing that there is nothing more to be done. As a way closes, a way opens and the new can begin with a fresh vibrancy. Gabriel Mojay writes that fennel is suited to the type of individual who tends to ‘over-think’ and over-analyse but is rarely able to communicate or put their ideas into practice. Because they find it difficult to articulate and express themselves or their feelings their emotions are locked inside building up tension that affects the bowels. These unacceptable, unexpressed thoughts and emotions are pushed below consciousness where they accumulate in the intestines as nervous spasm and gas. 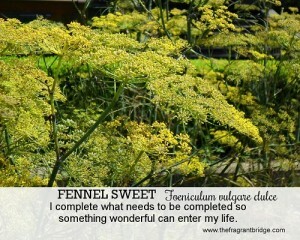 Fennel helps unblock these emotions allowing them to communicate freely, without fear or inhibition. As a result their urge to create is released. 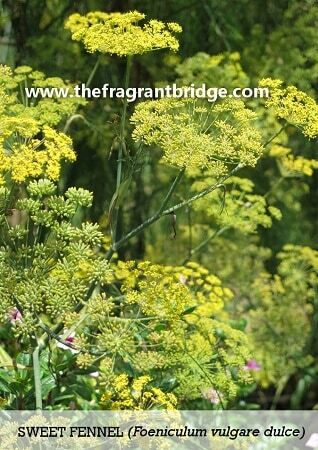 Fennel is a lively and dynamic oil that removes feelings of being overwhelmed, bored and afraid of failure. It leaves you enlivened and able to regain that competitive edge. Step up to the task, do not procrastinate, and enjoy the feelings of completing your goals. Communicate freely and with confidence. Stay ahead in the game of life and go for it, moving beyond stagnant thoughts that hold you back. It is time to take your place in the world. Fragrant Change Healing card: I complete what needs to be completed so something wonderful can enter my life. Should you continue persevering with something or someone in your life? Sometimes you give up just before attaining your goal. At other times you continue to persevere long after you should have let it or the person go. Is it time to bring something in your life to an end? This maybe a relationship that’s not working or some task or goal you set yourself. Do you really need to persevere with it or will letting it or the person go make space for the new to enter your life? Make a list of the plus and minuses of continuing down this path. If this is something you no longer want or need to do, finish it so you can move onto something that truly lights you up. Safety: Best avoided by those with epilepsy and pregnant and breast feeding women. This entry was posted in Essential Oils and tagged anxiety, communication, digestive problems, fennel seeds, stress on January 6, 2016 by Carole Hodges.